Chas Charles-Dunne wrote: Well, Lord Lyon and his staff are all civil servants and the Lyon Court and office are funded by the Exchequer. Moreover, the cost of a Scottish grant/matriculation is 2/3rds the cost of a CoA grant. Indeed, but Lord Lyon's Office has markedly different functions from the College, not least in functioning as a Court (which is why the present LL is a judge rather than an heraldic expert). I have no idea how much the LL Office receives in fees from its judicial functions, but it should be possible to peruse its accounts (though not I think the College's). PS: If Wiki is to be believed "The Lyon Court is a public body, and the fees for grants of arms are paid to HM Treasury." There is thus no direct linkage between the fees and the ability of LL Office to provide its services. I seriously doubt that the College is concerned that its price point is too high. Any strategy of keeping a business viable through such things as installment plans and cutting overhead and other costs is ultimately based on the premise that you want to sell more of your product. I don't think the kings of arms see increasing sales as their objective. Perhaps this would change if they saw the demand for new grants shrinking so severely that the economic survival of the institution was put in jeopardy, but there seems to be no foreseeable danger of this. If this one person unassisted could handle all the work--receive the application, research for duplication, record the registration, and prepare and send a response to the applicant--while also performing any other duties associated with running such an office (financial reports, dealing with IT, taking care of his own personnel business with his boss, whoever that may be, then the office would have to take in $486 per day to break even ($115,743 divided by 238 working days [52 weeks times 5 days a week, minus 10 federal holidays and 13 days of leave]). How long would it take one person to process one registration, assuming a serious effort is made to avoid duplicating arms previously recorded as having been used in the United States, and that any genealogical claims to previously existing arms have to be verified? One day? One week? Should we say three man-days on average? Let's use that for the sake of argument. That's almost $1500 per application. And how many applications would one expect? My understanding is that the CHI processes only 20-30 applications a year, Lyon Court about 50, and the College of Arms around 100 or so.... At $1500 per application, you'd have to process 75-80 registrations a year to cover just the salary of a single person. Start adding the additional personnel you'd actually have to have--no one runs an official heraldic office with one person--and the cost of supplies, utilities, office space, IT (none of which would be provided free in the U.S. system--all such support services are reimbursed by the using organization) and the price starts heading up to into Lord Lyon territory [Note: which was £2,236 as of 2013]. Note also that (a) no heraldry authority in the world turns around an application in three working days, which means the personnel cost per grant would actually be much higher than calculated here, and (b) there's nothing in these calculations for artwork of any kind--who's going to pay even $1500 for a grant of arms with no emblazonment? As I understand it, the SABH can operate at a lower price point in part because South African taxpayers subsidize it through the provision of free office space and administrative support as part of the National Archives. I don't know whether Lord Lyon has to pay rent for his space in New Register House in Edinburgh, but as noted above, even without having to pay for the offices the personnel costs alone would keep the cost of an English-style grant in any Western European or North American country at roughly the Canadian price range or above. Even a relatively simple registration with the two language-community heraldic offices in Belgium costs €500 plus the cost of artwork for the certificate, presumably another €500 or so at the going rate for good herald painters and calligraphers. 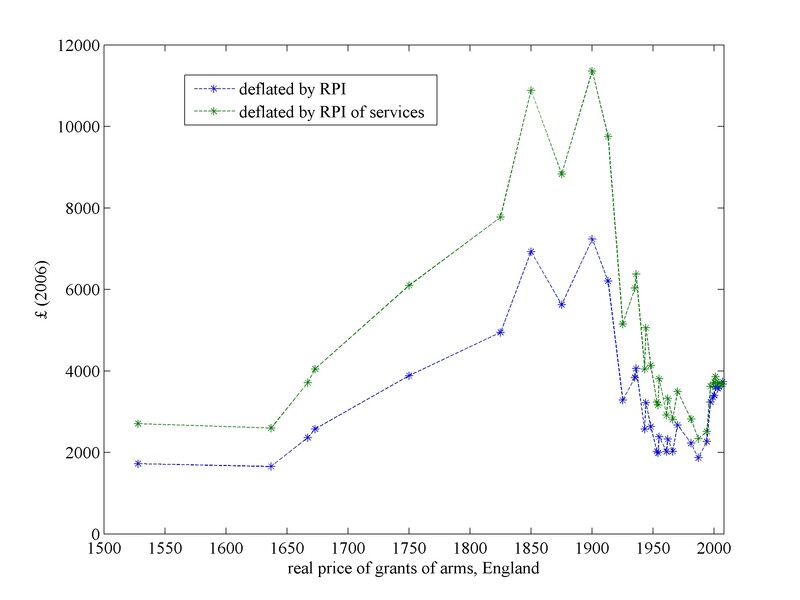 I meant to add that a discussion on rec.heraldry a few years back determined that the present-day price of a grant by the English kings of arms is now more or less the same, adjusted for inflation, as it was 350 years ago and a small fraction of what it was 100 years ago. See chart at http://www.heraldica.org/topics/britain ... t_fees.jpg. It is fairly clear that the price point in the 17th century was not set on the basis of cost accounting, and I would suggest that the same is true to some extent today. As Joseph says, the Bureau of Heraldry is funded by the taxpayer. Being a branch of the National Archives, which falls under the Dept of Arts & Culture, it is included in the DAC's annual budget, and the fees received are paid to the Treasury. The departmental reports which are published from time to time suggest that the revenue generated by the Bureau does not cover its expenditure, and probably never has. The Bureau's fees are determined by the Minister of Arts & Culture, in consultation with the Minister of Finance, and are increased from time to time. No doubt the Bureau, or the Heraldry Council, has some input into this. Well, I guess you got what you paid for: a registration that's legally meaningless in the country you live in, but full legal protection for the arms in a place you don't use them. But if you're happy with the purchase, I guess that's all that matters.